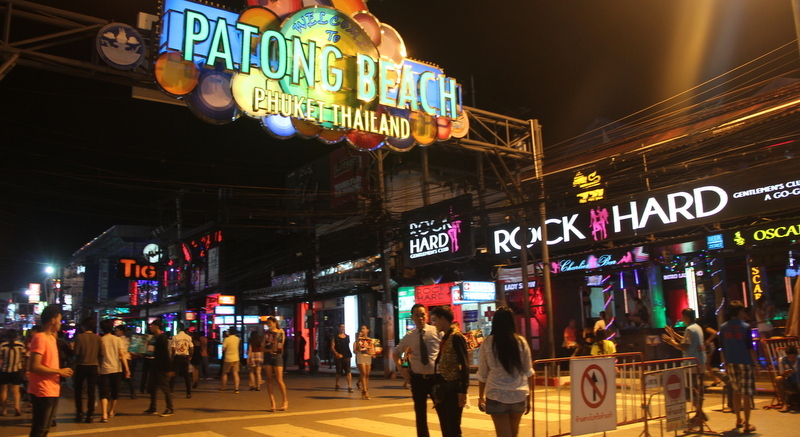 PHUKET: The crackdown on bars and clubs along Bangla Rd in Patong was eased this week with provincial officials revealing they will formally request that the government issue special dispensation to allow entertainment venues on Phuket’s prime tourist party street to stay open until 4am. The crackdown began last Monday (Jan 30), with all bars along Bangla Rd forced to close at midnight and nightclubs to kick patrons out into the street at 1am. “We have prepared a formal request to be sent to the Permanent Secretary of the Interior Ministry asking for consideration to allow entertainment businesses along Bangla Rd only to stay open – and sell alcohol – until 4am,” Phuket Provincial Chief Administrative Officer (Palad) Thawornwat Khongkaew, told The Phuket News on Wednesday (Feb 8). The request is for Bangla Rd only, Mr Thawornwat confirmed. “This because Bangla Rd is a very special tourist area,” he said. Mr Thawornwat was part of the joint law-enforcement team with Patong Police Chief Col Chaiwat Uikum and Kathu District Chief Chief Sayan Chanachaiwong who raided the bars and clubs on Jan 30. “The petition submitted by the Patong nightlife venue operators will be attached with our official letter, which must be signed by Phuket Governor,” Mr Thawornwat said. The Governor, Chockchai Dejamornthan, however, is away in South Korean until Saturday (Feb 11), Mr Thawornwat said on Wednesday. “I will follow up on this with the Governor as soon as practicably possible and follow this up with the Interior Ministry. We are hoping for a formal response before the end of this month,” Mr Thawornwat said. Phuket Vice Governor Siwaporn Chuasawad told The Phuket News that Gov Chockchai rated the issue a top priority. “Governor Chockchai wants to defuse the stress from this situation,” she said. “The feedback from this is that the crackdown also had a direct effect on many people who in the Patong nightlife industry,” she added. Mr Thawornwat added, “This is an uncomfortable situation in a tourism area. I think it is a good idea if there is special zone set up. If the nightlife venues are able to stay open legally, then tourists can enjoy themselves in a safe area. “Most tourists go out on Bangla Rd at about 11pm. If the entertainment area closes at midnight, where they will go? They might just keep drinking beside the road or on the beach, which risks their safety and only encourages criminals,” he said. “If this special zone is approved to stay open until 4 am, tourists will remain in an area where the police and officials are able to look after them. They will be safe,” he added. Eagle, you are being pedantic,  grow up son. Kurt... You contradict yourself in points 1 & 2, so no-one seems to fathom what you are saying. If you want to know where the Governor goes and why... just ring and ask. Rorii...perhaps you haven't heard, but we under Military rule. Just pay your taxes, the Military doesn't want to hear you, unless you "overstep the mark". Eagle, you not play fair in your comment to Rorii. You know very well, that is not a 'arrival short stay matter', as you like to play it. You try to downplay it to that. Stop discussing this in a 'holiday frame work'. So, the solution is quite simple. If there is a valid reason to change opening times entertainment places, ok, do that by law! Now, on Phuket we see daily that due to police corruption opening times don't need to be respected. But to make just a exemption for the 'Bangla Road Enclave' will not work. Swerv: Any citizen/resident of Phuket, thai and foreigner, have the democratic right to know what State Officials who serve the people (! ), are doing work wise. We read regular about the Governor local doings in Phuket press. Why not a press bulletin about the reason of his overseas trip? Yes, we have the right to know and we can ask, swerv. As Kurt is saying (and to the other commenter, theres plenty of farangs paying taxes here). The law is what should be followed, a clear and consistent law country wide. Dont like the law, lobby to have it changed, let all sides weigh in and debate, and then if it is changed, change it legally and properly for everyone. How is everything this moment about the environmental Phuket incinerator problems? Is this having Phuket Governor attention? Has he been briefed about it by his officials? Are all the incinerators now working full capacity to handle the daily about 600 Tons of Phuket rubbish? Kurt: What right have you to question what the Governor does? You are not Thai and you don't pay tax, so in other words you have no right to question his reasons and it is none of your business what he does and where he goes. Maybe Eagle is the Phuket Governor??? Very childish. Same old story, new boss comes in, " hmm ? i think i will start by cleaning up the Phuket image, let me close the bars in Bangla to a respectful time!". Old outcome, the corrupt who have their fingers in a diminishing pie complain and put the squeeze on. Outcome...same old story, bars, clubs etc back to as they were. With the large decline in western tourists these past 3 years, it's good to see a Phuket governor wants to turn things around. 1: My complains are not about enforcing good thai laws, Eagle. 2: I appeal on enforcing thai laws, if not, than change them. 3: Don't give us all that thai nonsense of " we need illegally to feed families". 4: Yes, the citizens of Phuket, thai + foreigner, have the right to know why the Phuket Governor, a peoples servant paid by the thai people, travels to South Korea. For what? It's all a facade and all about the money. Just like many other 'issues' in Phuket. That counts for Bangla Rd as well, so enforce the closing time at 01:00 AM a few months and you will see that the tourists will adjust their Bangla time. Justification that Police and officials are better able to look after tourist safety is a non reason. Normally Patong police doing her best to stay away from Bangla Road. And who are the other 'officials'?